My friend Emily at Mommy's Nap Time has started a new linky party called Sew Thinky Thursday!!!! It is a question and answer link up so all us on the internet can share our stories and get to know each other better!!! What a great idea Emily!!!!! Many years ago in a galaxy far far away...or at least in Southern California, there was a girl ( 40 years young), a new baby boy and not a whole lot of fashion going on. Well, almost, there was fashion for boys but it was usually expensive or just plain ugly! This is why I started sewing...isn't he a doll! Retro Rocket Rascals by Michael Miller is STILL a favorite print! The truth is my grandmother was an excellent seamstress, as are my Aunt and my cousins. My sister sews but she is a natural artist, I got the height ( am over 5-6 and she is a maybe 5-2) she was given the MOST amazing artistic talent! I think she got the better end of that deal! My mother did not sew, well, that is not true...she did make a few things but has never really liked sewing or unsewing mostly. She had an old Singer in her bedroom that I would look at from time to time but it went unloved by anyone that could actually sew. So my grandmother would make clothes for my sister and me and they were always put together so quickly and perfectly, it was like magic. My grandmother was an excellent seamstress but she was a very impatient teacher. She did let me play at her machine a few times but I was not a natural at the machine so she would shoo me off to go find something else to do. I was, however; very very good at going to the fabric store and looking through the books of Simplicity, Vogue and McCalls patterns and could have walked through the isles of different fabrics and notions forever! When the question was "Who wants to go to the fabric store?" the answer was ALWAYS..."ME!" Fast forward to the year 2006...me pregnant and on bedrest for three and a half months with a sweet little boy that needed some more time. I had TONS of time and the internet, so many things to see for babies and so many things to make! I thought I would crochet a blanket but honestly had completely forgotten how...I was a victim of pregnancy brain! That skill has never come back to me but has now been replaced with another creative outlet that I love even more! I had bought some fabric some thread and that was about it, I tried some straight stitches and took the big leap into zig zag...WOO HOO!!!! This was fun but what now? I realized that I needed a project, a real project so show to people and to complete so that I could justify buying this machine to the in house engineer that thought I was crazy. So I decided to embellish some prefolds of the babes. I cloth diapered and loved my prefolds but why not make them FUN! So, I did! I successfully made something! I had a need that turned into a PASSION that I love to share!!!! I'm so glad you joined in the thinky and linky fun today, I loved reading more about you and your sewing journey. What gorgeous big blue eyes your wee one had (and I'm sure still has!)! Oh it's always the kid's fault! So glad you found a good dealer who had a good used machine you could love. 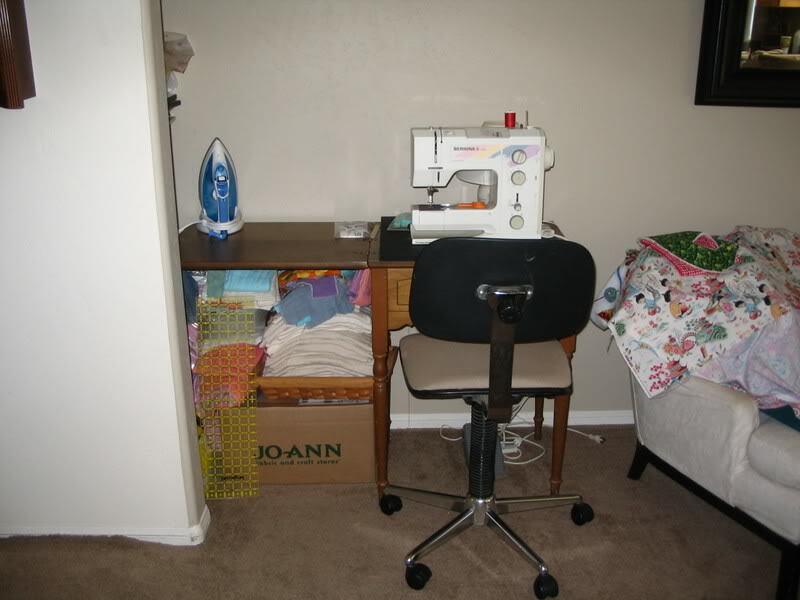 loved reading about your sewing journey. of course, i was struck by the 3 months (!!!) of bedrest... how tough, but what a cutie! EEKS! He's such a cutie!...Oh, I love the bib and your story too...getting back to that cute baby - do you see those cute little rolls of fat on his legs? Too cute! 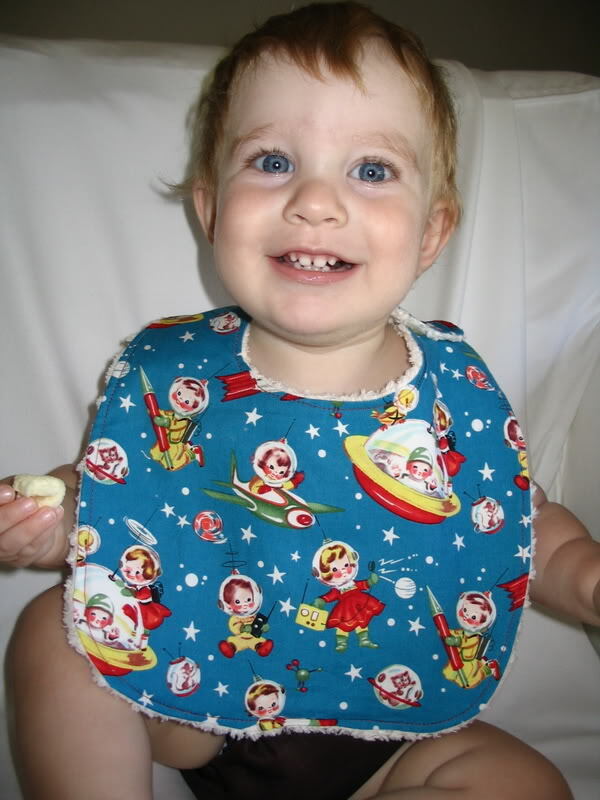 I really do love the bib and I'm sure you can find other fun stuff to make with the machine. I've made shirts for boys and had a blast. And now they make the cutest fabric. It's Shannon (Craft Addict) from IG. I am struck by the similarities we share! I, too, began sewing after the birth of my son - and after bed rest. My first project was with a Robert Kaufman print that looks a lot like this, called "When I Grow Up". I went through a lot of machines, which I also took back, and finally went with the suggestion of a kind man in a sewing store. It is so nice to find a kindred spirit. I'm a self taught sewer, and not nearly as good as you, so you are an inspiration to me! I live in the Bay Area and you know - not a lot of quilters around here. In fact, I know none. Thank goodness for the like-minded souls I have found online and on IG. It's funny...when you are in your house, sewing away for you babies, you think you might be the only one on the planet doing so under the age of 80. But it turns out, we are in good company! Maybe one day I will be brave enough to even go to QuiltCon! Take care and keep up this great blog!